Beauty is all about looking good – having clear skin, makeup being on point, dressing your best and what else? Oh wait, let’s not talk about inner beauty yet alright? To me, beauty is also about wearing your most confident and genuine smile that radiates even through your eyes. A smile a day brings people your way! (Okay I’ve just made that up but hey, it rhymes!) To achieve that electrifying smile, having sparkly shiny teeth plays a huge part too, especially if you are someone like me who likes to smile with teeth showing through. However, more often than not, our lifestyle habits such as drinking coffee or wine can stain teeth, but fret not, iWhite Instant Teeth Whitening is here to give you a set of sparkly white teeth to inspire greater confidence in your smile! 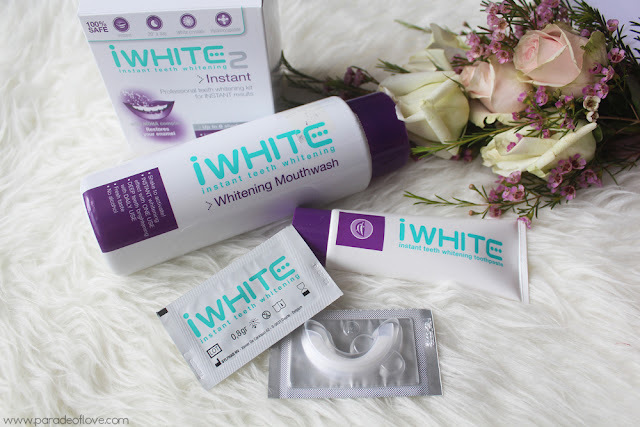 iWhite’s triumvirate of teeth whitening solutions — iWhite Instant Whitening Kit; iWhite Instant Whitening Toothpaste; and iWhite Instant Whitening Mouthwash —utilises a triple action whitening technology buoyed by three active ingredients: phthalimidoperoxycaproic acid (PAP); bioactive crystals; and bioavailable calcium deposits. As its name suggests, the brand really does offer immediate teeth whitening results, tried and tested! Let the rest of the photos do the talking, shall we? 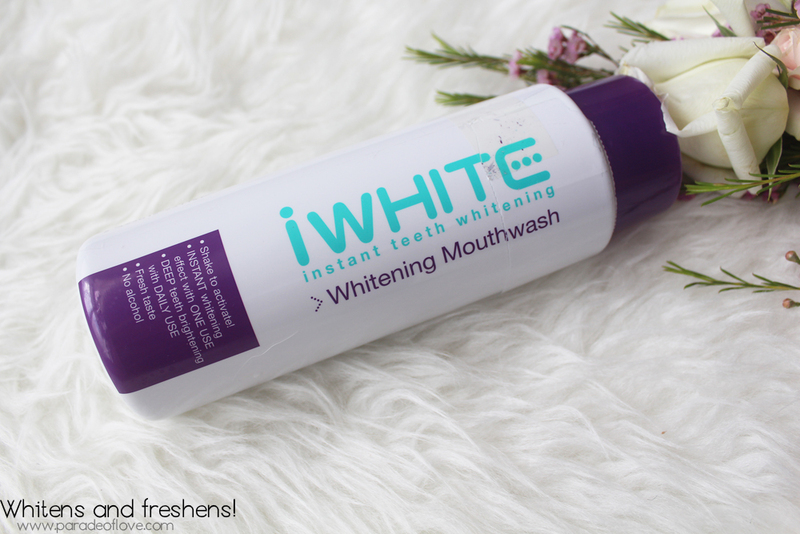 Starting off with my favourite product, the iWhite Instant Whitening Mouthwash is one of the most convenient solutions to combat plaque and teeth stains. Honestly, an everyday solution like that is very much appreciated for the busy working community. All you need is 30s after brushing your teeth to rinse your mouth and you’re good to go! The mouthwash contains blue covarine, a substance which places an ultrathin film over the teeth’s surface during the rinsing action. 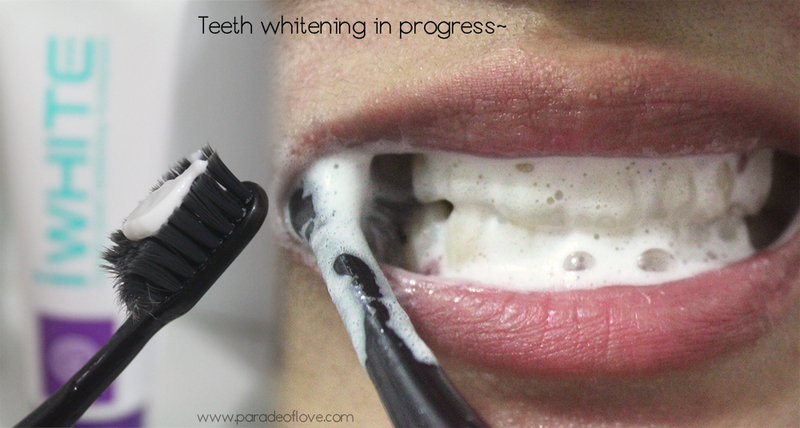 It works to alter the way light glints on teeth, thus giving a visible white appearance upon first rinse. Additionally, ingredients like Hexametaphosphate and PAP work in tandem to remove and prevent plaque, while fluoride imbues teeth with tooth-strengthening ability. Even though the formula is alcohol-free, somehow it just tastes and smells like every other mouthwash with alcohol content. 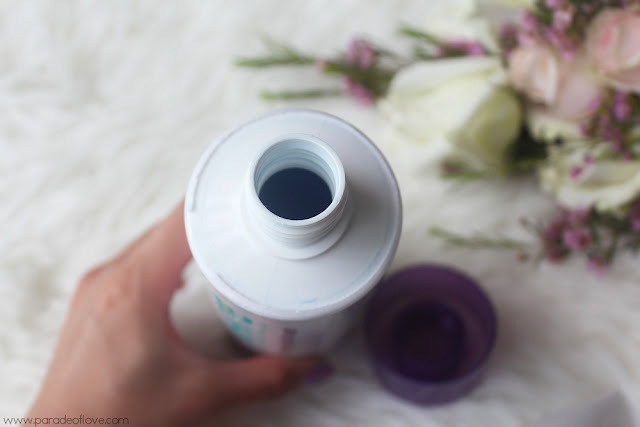 The mouthwash doesn’t sting like most commercial mouthwashes. It just gives you a nice cooling, minty sensation. With just one rinse, you could visibly see that the areas of the teeth nearest to the gums have become less yellow and those are common areas where teeth-staining takes place. Not to mention that you’ll have fresher breath too! The toothpaste comes with a safety seal to ensure the product’s hygiene. 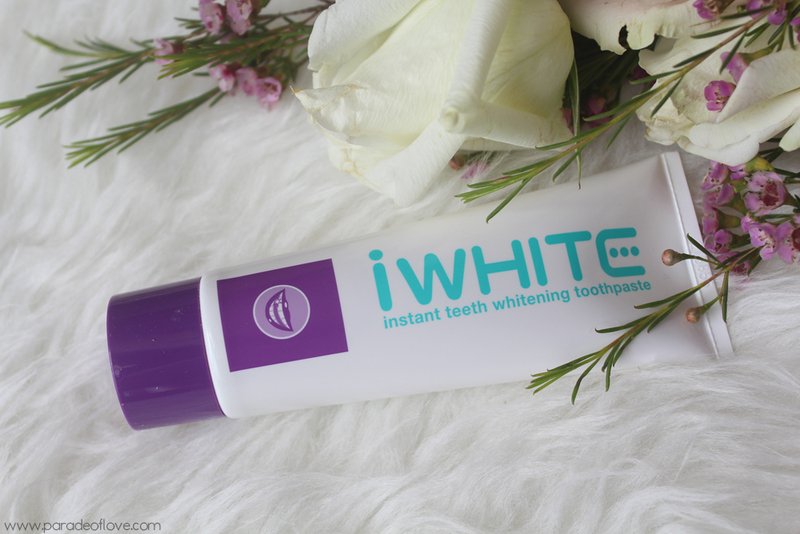 In my opinion, this is pretty much like normal toothpaste but I guess the whitening particles help to work even harder in whitening the teeth. It’s a good-to-have but not an essential. 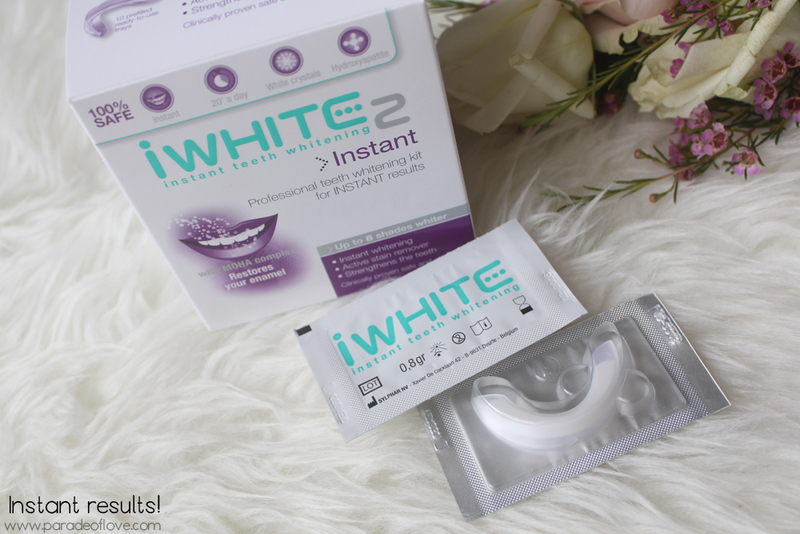 Also in the range is the iWhite Instant Whitening Kit that actually works! Not that I’ve tried any whitening products before but I can visibly see the whitening effects of this kit. 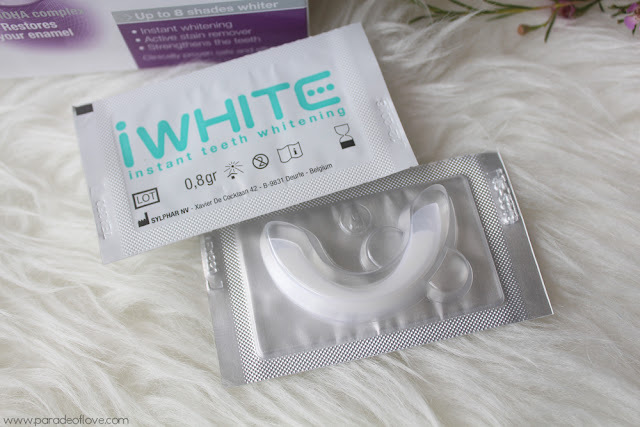 Comprising of 10 prefilled, thin and flexible trays, the instant whitening kit is designed for the urban dwellers like us with maximum performance in mind. All you need to do is to wear the tray for 20 minutes a day for up to five consecutive days. 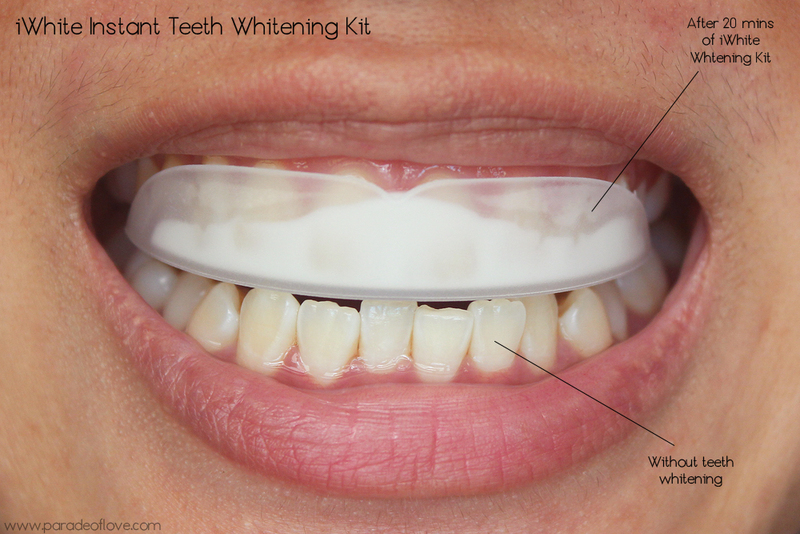 The tray contains whitening gel that will work to remove the stains and polish your teeth for a whiter result. Before application, you’ve got to ensure that your teeth are clean, so brush them first. Remove the prefilled tray from the sealed sachet and fit the tray onto the top and bottom row of your front teeth. 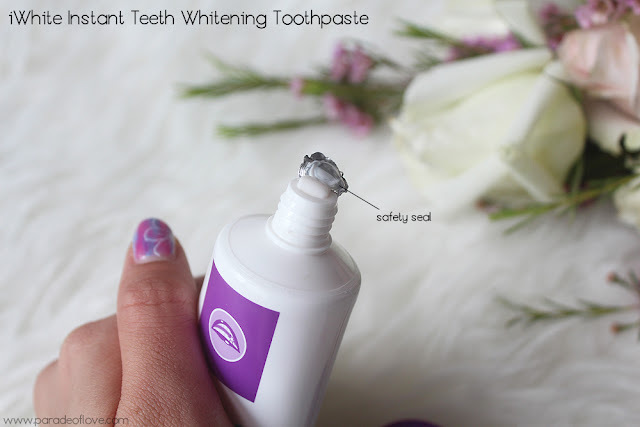 Ensure that the gel is in contact with the teeth’s surface. 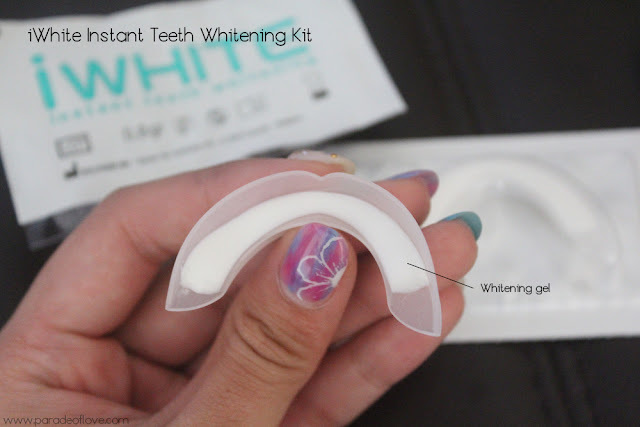 Gently rinse after 20 minutes to remove all the whitening gel contained. Can you see that the top row of my teeth is actually whiter than the bottom row? I’ve experimented with just the top row so that I could do a comparison and woohoo, it works! 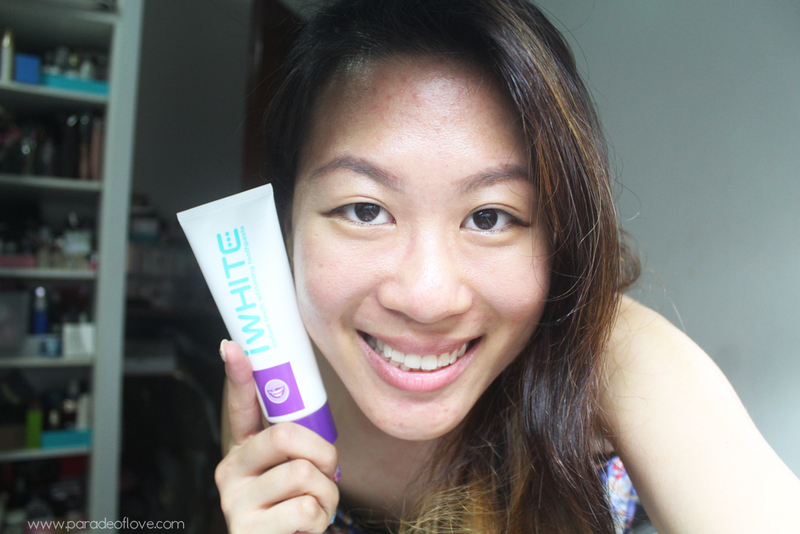 After testing out the whitening range, I’m truly impressed. I mean, you’ve seen the results for yourself. I’m going to continue with the routine to see how much whiter my teeth can get. If you’re looking for an instant whitening solution, especially after drinking coffee, consider investing in the mouthwash or toothpaste to bring along with you. 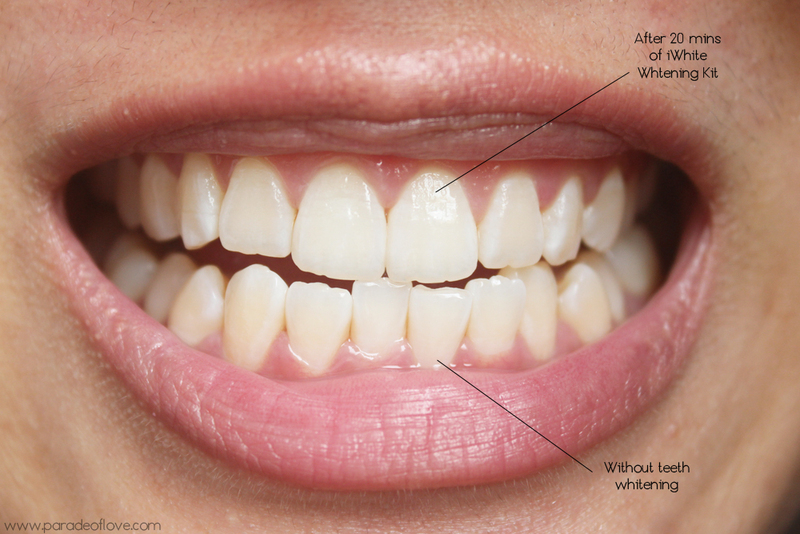 You could do some instant whitening after a coffee or a wine-drinking session. Disclaimer: Products were provided by iWhite Singapore for consideration. The above review is based on my true and honest opinion and experience, without influence from others or the brand. It does contain information from the brand itself. I am NOT affiliated nor compensated by the brand.